This page will automatically change every time a new sermon is posted. If you scroll further down the page, you will see sermons from previous weeks. The triangle ("play") button will play the sermon audio. The download button will allow you to download the file. You can then play it on your computer, including when you are offline; burn it to a CD; or put it on a media player (e.g., an iPod). You need to start with iTunes downloaded. If you do not yet have this program, download it here: www.iTunes.com. 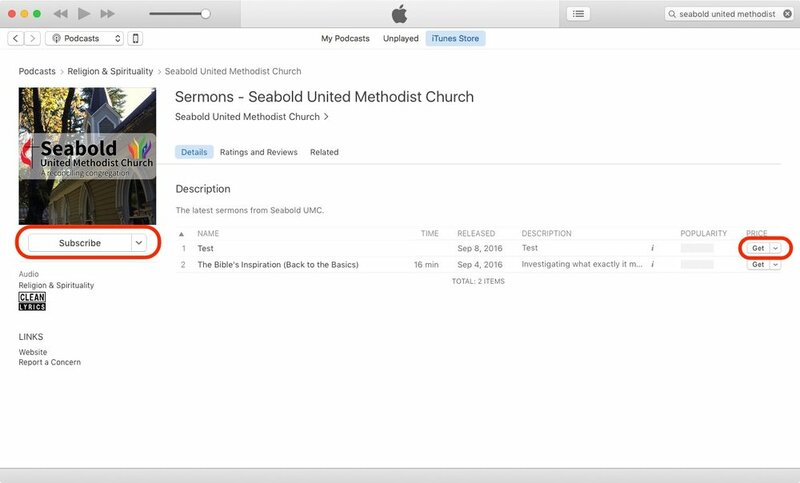 The easiest way to access our podcast (audio program) is through this link: https://itunes.apple.com/us/podcast/sermons-seabold-united-methodist/id1152125427. This will open an iTunes webpage. From this page, click on "View in iTunes." Depending on your operating system, a pop-up window may appear asking you to open the link in iTunes. You should make sure "iTunes" is selected and hit OK.
iTunes should open. From this window, you can select "Get" to download individual sermons. Or, you can select "Subscribe" to have iTunes automatically download future sermons as they become available. If a window pops up, you will need to confirm your subscription by clicking the "Subscribe" button. Click on this link: https://play.google.com/music/listen?u=0#/ps/Itzow2ggwoaxgqgkaq62v6mip6i. Click on the sermon title to play. You can also subscribe to the podcasts to get them automatically downloaded. Click on "Subscribe" to do this.